NEW DELHI: Finnish mobile communications company Nokia Corporation President and Chief Executive Officer, Rajeev Suri, met Indian Prime Minister Narendra Modi and discussed its role in ‘Digital India’ and ‘Make in India’ campaigns. The focus of the meeting was on Nokia India’s operations and the role the company can play in supporting the country’s transformation through telecommunications and technology led by flagship initiatives such as Digital India and Make in India. 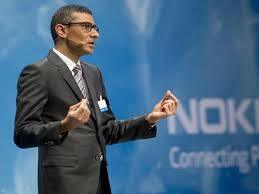 “Nokia supports the Prime Minister’s vision for India, at the heart of which is telecommunications and technology. We believe we are on the path to a connected world where people and tens of billions of devices will be linked together in extraordinary ways, creating new social and economic opportunities for all,” Suri said. Countries like India, with their demographic dividend and comfort with mobile technology, are in a position to benefit immensely from this development, and thus initiatives like Digital India are crucial. Nokia, with its three strong businesses of Networks, HERE and Technologies, and its manufacturing and research and service delivery operations in India, is ideally positioned to support these initiatives and contribute to growth. “Nokia is a leading global player in mobile communications. India remains a strategic market for us, and is our largest country in terms of employees, with over 16,000 people employed,” he added. Nokia CEO meets PM; discusses opportunities in India 0 out of 5 based on 0 ratings. 0 user reviews.